BREAKING NEWS SPECIAL: Kamal Haasan Remembers Sridevi: "Sadma's Lullaby Haunts Me Now"
Kamal Haasan Remembers Sridevi: "Sadma's Lullaby Haunts Me Now"
Kamal Haasan and Sridevi shared screen space in Sadma. Actor Kamal Haasan paid his condolence to Sridevi, who died in Dubai on Saturday after a cardiac arrest. 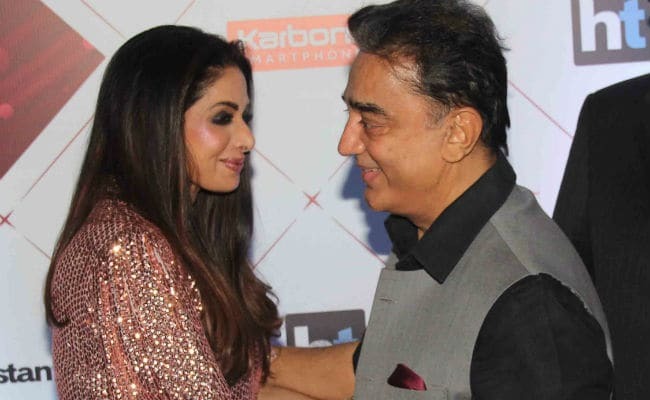 Kamal Haasan, Sridevi's co-star of films like Sadma, Aakhri Sangram, recalled the 'happy moments' he had spent with her and also remembered the last time he met the actress. Early this morning, in a tweet, Kamal Haasan wrote: "Have witnessed Sridevi's life from an adolescent teenager to the magnificent lady she became. Her stardom was well deserved. Many happy moments with her flash through my mind including the last time I met her. Sadma's lullaby haunts me now. We'll miss her." Sridevi was 54 and had gone to Dubai to attend nephew actor Mohit Marwah's wedding. Here's what Kamal Haasan tweeted about Sridevi. Sridevi and Kamal Haasan had recently met on the red carpet of HT India's Most Stylish Awards 2018 in Mumbai. Tamil movie Moondru Mudichu (1976), starring Kamal Haasan, was Sridevi's first film as a leading heroine. She debuted in the industry as a child actress. Later, Sridevi and Kamal Haasan co-starred in Tamil films like 16 Vayathinile and Guru. Sadma is considered to be one of the best films of Sridevi and Kamal Haasan's career. It was a remake of Tamil Film Moondram Pirai and starred both these actors. Kamal Haasan had received a National Award for his performance in Moondram Pirai. Both the films were directed by Balu Mahendra. Prime Minister Narendra Modi also tweeted his condolences. "Saddened by the untimely demise of noted actor Sridevi. She was a veteran of the film industry, whose long career included diverse roles and memorable performances. My thoughts are with her family and admirers in this hour of grief. May her soul rest in peace," he said. Sridevi was last seen in MOM. Her elder daughter Janhvi Kapoor is currently shooting for her debut Hindi film Dhadak. She did not accompany Sridevi in Dubai while younger daughter Khushi Kapoor and husband Boney Kapoor were there. Sridevi had worked in films such as Mawaali (1983), Tohfa (1984), Mr India (1987) and Chandni (1989).